After school hour each student once a week are compulsorily playing indoor or outdoor games. They also participate in inter house competition in different games like Dodge Ball, Danish Rounders, Throw Balls, etc. Beside this the talented sports woman are separately trained for Basket Ball, Hand Ball, Base Ball, and Throw Ball. 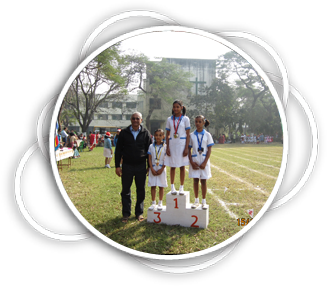 Students participate in different intra and inter school events like Dancing, Singing, Debate, Elocution, Quiz, Drawing, etc. at different levels like District, State and National. Students are encouraged to go for Camps like rock climbing, trekking, etc organized by different organizations.